And never was costlier fare. Sir Amadey Finvinerro, investigator for the Crown, delves into the death of a Baron’s son on an island far from the mainland. The year is 1727. It is clear that Finvinerro has been successful in his career devoted to law and order, as his manner is that of one who expects results from himself and there is little that can surprise him in regard to the frailties of mankind. A lesser man might be egotistical. But to Finvinerro, success in his investigations is as requisite as his proper stylish attire. He takes no offense at the animosity of others, nor does he rail at roadblocks that delay his resolution of a case. However, this particular case threatens the pragmatic world of Finvinerro, for as elements unfold there is the realization that this case not only involves the earthly world but also the realm beyond the grave. Dead Reefs, the small island where the story takes place, has a sordid past. A hundred years earlier, the ancestor of the present Baron was a cut-throat pirate. He and his men lured ships onto the jagged island reefs, subsequently slaughtering the occupants and stealing whatever riches were on board. As the legend has it, a relic was seized in one such raid, although a dying monk warned with his last breath of a terrible curse surrounding that treasure. Shortly afterward, the pirate Baron’s wife met her death from the Baron’s own sword. Every nine years afterward, someone has died under mysterious circumstances on the island. The islanders, already a suspicious and unfriendly lot, are unwilling to assist a mainlander with any investigation. Instead they seek to isolate themselves from the out of doors and the upcoming nine year anniversary. It is the general belief that the Baron’s son died from an accidental fall which has no connection to the curse, and that there is at least one more death to follow. As Finvinerro traces the dead man’s steps he finds a trail of contradictory evidence. He has to suspend his disbelief in the supernatural as he is thrust into a world beyond the mortal realm. Successful resolution of this case depends on it. From the secret passageways inside the Baron’s estate, to the entreating ghost, the sinister characters in the forest and the witch with her bubbling cauldron of magic formula, I was well and truly hooked on this gothic tale. The musical score is an orchestral dream, haunting and plaintive, evoking emotion and mood as the scenery changes. I lingered in the Baron’s garden for some time, content to experience a song of the heart which I believe had a romantic Russian flair. Composer Nicholas May should be congratulated for his remarkable work. Ambient sound is likewise well done, highly atmospheric and immersive. 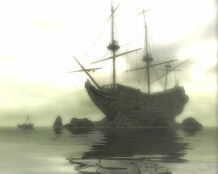 The crashing of waves against the shore, a boat’s oar slicing the water, the cry of seagulls – all these and more serve to make the player believe he is actually on that island. Footsteps change in sound according to the terrain, a most delightful quality. I’m aware that tastes may differ dramatically, but I thought the voiceovers were well done, and the main character's voice was in keeping with his personality. I would wish for more dialog in this game, but the scarcity does seem to add to the moodiness of the plot. Again, atmospheric and well rendered in 3D. The detail in objects is mesmerizing, from the ground and rock striations to the smoke blackened estate hallways. The colors are earthy and muted in intensity, although an occasional inventory item will appear brighter in contrast to its surroundings. The animations are excellent. 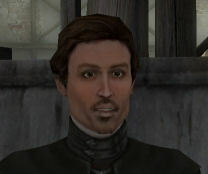 Character models are intensely detailed, including facial expressions. Many of the characters one meets in the game are somehow just a bit odd, in keeping with a gothic tale. The main character will draw the inevitable comparison to the actor Johnny Depp, something I for one did not find displeasing in the least. I hope the developers continue with this character in other games. I’m of the thought that developers should usually leave supernatural elements in a blur unless they can design them to be absolutely believable. This game has accomplished this, and to an exquisite degree so that you are not abruptly reminded that you are playing a game. The artistry of the ocean surpassed anything I had ever seen in an adventure game. I almost believed I could reach out a hand and touch the water as it swirled before me. A fault I saw graphics-wise was a tendency to make occasional screens too dark -- atmospheric, but at the expense of easy navigation. There is also a tendency to make foliage too symmetrical, and not allow for more weather effects. It is an island after all, and yet the wind doesn’t blow. There should be more than a leaf falling here and there, whimsical though that is. The puzzles are mostly of an inventory nature and/or requiring logic. They are cleverly interspersed throughout the story in a natural manner, and do not appear to be puzzles just for the sake of puzzles. Although there are a few old chestnuts that experienced gamers may have solved a countless number of times in other games, there are others that are fresh and interesting. I particularly enjoyed a runes puzzle in which you combine ingredients for a witch’s potion. However, notes contained within such puzzles could have been more clear and legible. As I mentioned before, some inventory items are brighter in shade and stand out against the darker backdrop, while others should be more conspicuous to avoid making it necessary to pixel hunt. Some use may be made of the “X” key on the keyboard to help in finding items or areas of interest, with a large eye superimposed over the area in which the gamer needs to focus attention. There are two puzzles that had odd solutions which required an interaction between an inventory item and a completely unrelated object in the landscape. A notebook is available that updates progress throughout the game. 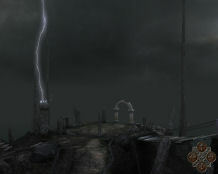 It contains some clues for puzzles and sometimes offers a hint of what next needs to be accomplished in the game. On one occasion the clues to a puzzle were misleading, but trial and error overcame this. There is one sound puzzle which requires the mimicking of tones. There are no sliders. Although following the cave paths may be somewhat maze-like because of the darkness of the screens, it is essentially simple. However, there is a maze in a forest that is more difficult. Allegedly you are to follow footprints, but the coloring of the ground is such that the footprints blend into the background color. 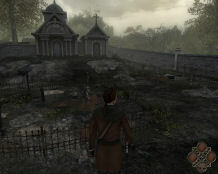 The game is linear, and certain scenes, items and actions will not appear without the appropriate triggers. There are three incidences that require a quick response. One aboard a ship is problematic because of the awkward controls. In addition, shifting camera angles made one or two puzzles more difficult than need be. Here is where a game that could easily have become a top adventure choice for many gamers instead becomes a lesson in aggravation. The game is played from a third person perspective, via keyboard. Movement is accomplished by use of the WASD keys, although the “S” key is not for the standard keyboard maneuver of backing up, but rather takes the character in a 180 degree spin. I am no stranger to keyboard games, and sometimes even prefer that method for games including a lot of interaction. However, there is not as much interaction in this game as the 3D environments should have made possible, so there appears to be little reason for the necessity of keyboard controls. Instead the developers might have used mouse control as they did on their two previous games for a more seamless gaming experience. Hitting the “S” key, only to find myself in a whirligig that seemed to last forever, and having the character move on his own long after keys were pushed -- in the process missing doors and steps -- was frustrating, to say the least. I changed from the default “run” to “walk” via the shift key, and this tended to make the errors less significant. Using walk instead of run did not have any impact on the puzzles requiring a quick response. Saves are unlimited, with a captured picture indicating the game location, which is my preferred method of saving games. Saves can be made anywhere in the game outside of cut scenes, conversations or closeups of puzzles. This is also a welcome quality. The game is alt/tab friendly. The game plays without the CD in the drive. The game installed easily, and played without bugs, glitches or crashes. Ask most adventure game players what the most important part of an adventure game is to them, and they will answer “the story.” The story of this game is immersive, lengthy and magical in the fashion of a gothic novel. More weight is given to the story and the game is graded accordingly.